1. Is TB still a public health problem worldwide and in the United States? Fact: TB is one of the world’s deadliest diseases. One-third of the world’s population is infected with the bacteria that causes TB, and each year, over 9 million people around the world become sick with TB disease. Almost one-and-a-half million deaths worldwide occur each year from TB. In the United States, 9,105 TB cases were reported during 2017. 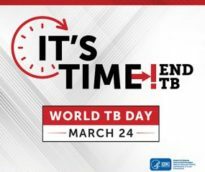 While TB rates in the United States have been declining slowly since 1993, there remains a disproportionate burden of TB among racial and ethnic minorities. TB rates are higher for some racial and ethnic groups, probably because a greater proportion of people in these groups have other risk factors for TB. 2. Does everyone who becomes infected with TB bacteria get sick? Fact: Not everyone infected with TB bacteria becomes sick with TB disease. People who become infected, but are not sick have what is called latent TB infection (LTBI). People who have LTBI do not feel sick, do not have any symptoms, and cannot spread TB bacteria to others. But some people with LTBI go on to get TB disease. People who have TB disease do feel sick, have signs and symptoms, and may spread TB bacteria to others. Learn more about the difference between LTBI and TB disease. 3. Can some people get TB disease easier than others? 4. What kinds of tests can detect TB infection? Fact: Two Tests: A skin test or a TB blood test can be used to detect TB infection. The Mantoux tuberculin skin test is performed by injecting a small amount of fluid (called tuberculin) into the skin in the lower part of the arm. A person given the tuberculin skin test must return within 48 to 72 hours to have a trained health care worker look for a reaction on the arm. The TB blood test measures how the person’s immune system reacts to the bacteria that cause TB. 5. How are latent TB infection and TB disease treated? Fact: LTBI and TB disease can be treated by taking medicine. It is very important that people take the drugs exactly as they are told. If you stop taking the drugs too soon, you can become sick again. If you do not take the drugs correctly, the bacteria that are still alive may become difficult to treat with those drugs. You should take medicine as recommended by a doctor. Learn more about TB treatment.